Spanish martyr and writer who flourished during the reigns of the Cordovan Caliphs, Abd-er-Rahman II and Mohammed I (822-886). It is not certain on what date or in what year of the ninth century he was born; it must have been previous to 819, because in 848 he was a priest highly esteemed among the Christians of Catalonia and Navarre, and priesthood was then conferred only on men thirty years of age. The family of the saint was of the nobility and held land in Cordova from Roman times. The Mussulman rulers of Spain, at the beginning of the eighth century, tolerated the creed of the Christians and left them, with some restrictions, their civil rule, ecclesiastical hierarchy, monasteries, and property, but made them feel the burden of subjection in the shape of pecuniary exactions and military service. In the large cities like Toledo and Cordova, the civil rule of the Christians did not differ from that of the Visigothic epoch. The government was exercised by the comes (count), president of the council of senators, among whom we meet a similarly named ancestor of Eulogius. The saint, like his five brothers, received an excellent education in accord with his good birth and under the guardianship of his mother Isabel. The youngest of the brothers, Joseph, held a high office in the palace of Abd-er-Rahman II; two other brothers, Alvarus and Isidore, were merchants and traded on a large scale as far as Central Europe. Of his sisters, Niola and Anulona, the first remained with her mother; the second was educated from infancy in a monastery where she later became a nun. After completing his studies in the monastery of St. Zoilus, Eulogius continued to live with his family the better to care for his mother; also, perhaps, to study with famous masters, one of whom was Abbot Speraindeo, an illustrious writer of that time. In the meantime he found a friend in the celebrated Alvarus Paulus, a fellow-student, and they cultivated together all branches of science, sacred and profane, within their reach. Their correspondence in prose and verse filled volumes; later they agreed to destroy it as too exuberant and lacking in polish. Alvarus married, but Eulogius preferred the ecclesiastical career, and was finally ordained a priest by Bishop Recared of Cordova. Alvarus has left us a portrait of his friend: "Devoted", he says, "from his infancy to the Scriptures, and growing daily in the practice of virtue, he quickly reached perfection, surpassed in knowledge all his contemporaries, and became the teacher even of his masters. Mature in intelligence, though in body a child, he excelled them all in science even more than they surpassed him in years. Fair in feature [clarus vultu], honest and honourable, he shone by his eloquence, and yet more by his works. What books escaped his avidity for reading? What works of Catholic writers, of heretics and Gentiles, chiefly philosophers? Poets, historians, rare writings, all kinds of books, especially sacred hymns, in the composition of which he was a master, were read and digested by him; his humility was none the less remarkable and he readily yielded to the judgment of others less learned than himself." This humility shone particularly on two occasions. In his youth he had decided to make a foot pilgrimage to Rome; notwithstanding his great fervour and his devotion to the sepulchre of the Prince of the Apostles (a notable proof of the union of the Mozarabic Church with the Holy See), he gave up his project, yielding to the advice of prudent friends. 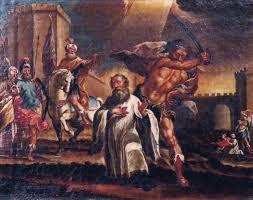 Again, during the Saracenic persecution, in 850, after reading a passage of the works of St. Epiphanius he decided to refrain for a time from saying Mass that he might better defend the cause of the martyrs; however, at the request of his bishop, Saul of Cordova, he put aside his scruples. His extant writings are proof that Alvarus did not exaggerate. They give an account of what is most important from 848 to 859 in Spanish Christianity, both without and within the Mussulman dominions, especially of the lives of the martyrs who suffered during the Saracenic persecution, quorum para ipse magna fuit. He was elected Archbishop of Toledo shortly before he was beheaded (11 March, 859). He left a perfect account of the orthodox doctrine which he defended, the intellectual culture which he propagated, the imprisonment and sufferings which he endured; in a word, his writings show that he followed to the letter the exhortation of St. Paul: Imitatores mei estote sicut et ego Christi. He is buried in the cathedral of Oviedo.